Joan Huckfield was the new name on the leader board for the South Kyne Golf Club ladies’ EWGA July Sunday Medal. A 68 net finally meant a cut in handicap for Joan. Second with 71 was Sue Roberts, beating third placed Jane Barlow on a countback. The EWGA Tuesday Medal was won by Anne Clayton with net 69. Sue Roberts (74) was runner-up and in third with 77 was Sandra Lee. Joan won the Order of Merit points. 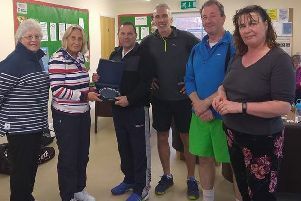 The June Monthly Medal was won by Sue Anniball with 34 points. Runner-up with 32 was Heather Dopierala, and Sue Roberts (29) finished third. The weather was very kind for the ladies’ return league match with Kirton Holme at South Kyme, with a home team win of 4-0. The end of the month Stableford roll-up was won by Sandra Lee with 34 points. In second place was vice-captain Sue Duncan, whilst Heather Dopierala was third. The last league match of the season was played at Burghley Park. The weather was perfect but it did nothing to help the visiting South Kyme ladies who lost 4-0. Congratulations did, however, go to South Kyme lady captain Sue Annibal who managed a hole in one on the third hole. The annual Cooks Shield was played with the seniors with the usual fun and good humour. Sue Abnibal and Ray Duncan won with 42 points, whilst second were Sue Duncan and Pete Zammit on 41. Third on countback with 39 were Anne Clayton and John Dyson. The Williams Trophy was won by Sue Annibal and Jane Barlow. Heather Dopierala and Elaine Sturton were runners-up, with Myra LeSage and Shirley Westlake in third spot. The Medal winners Championship this year was won by Jane Coleman with a net score of 68. Runner-up was Sue Roberts with 73 and Myra LeSage (75) was third. The July Stableford was won by Heather Dopierala with 36 points. Three points adrift was Sue Annibal, whilst Sue Roberts was third with 29. In wet and cold conditions, the Cutting Cupboard Trophy winner was Jane Coleman with net 70. Sue Annibal finished second with 72 and Heather Dopierala was third on 74.